John J Fox III grew up in Richmond, Virginia. He graduated from Washington & Lee University with a U.S. history degree. After school he served on active duty in the U.S. Army for seven years as an armor officer and aviator. He belongs to the Museum of the Confederacy, the Civil War Preservation Trust and is a member and past commander of Turner Ashby Camp #1567, Sons of Confederate Veterans. 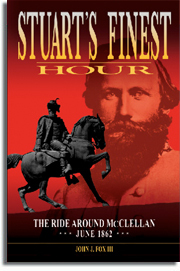 His most recent book, Stuart’s Finest Hour Hour: The Ride Around McClellan, June 1862 was released at historic Hanover Tavern in September 2013 and received a bronze IPPY Award for non-fiction. 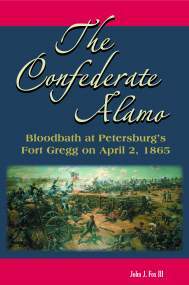 His book, The Confederate Alamo: Bloodbath at Petersburg’s Fort Gregg on April 2, 1865, was released in April 2010 at Pamplin Historical Park to commemorate the 145th anniversary of the Battle of Fort Gregg. It subsequently won a silver IPPY Award for non-fiction. His first book, Red Clay to Richmond, received considerable critical acclaim from fellow historians and book reviewers and won two book awards. His articles have appeared in Civil War Times magazine, America’s Civil War magazine and numerous newspapers. 2014 IPPY Award for Stuart’s Finest Hour. Presented by Independent Publishers and the Jenkins Group. 2011 IPPY Award for The Confederate Alamo. Presented by Independent Publishers and the Jenkins Group. 2010 Stewart Bell, Jr. Literary Award given by the Winchester-Frederick County Historical Society for co-authoring A History of Opequon Presbyterian Church with Lang Gordon and Art Stanley. 2006 Georgia Historical Records Advisory Board Book Award given by Georgia Secretary of State for Red Clay to Richmond. 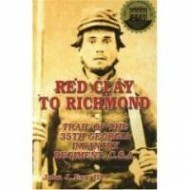 2005 James I. Robertson Jr., Literary Prize for Confederate History given by the R. E. Lee Civil War Round Table of Central New Jersey for Red Clay to Richmond. 2005 Jefferson Davis Historical Gold Medal given by Turner Ashby Chapter 184 UDC in Winchester, Va.
Tuesday, May 14, 2013 – Roanoke, Va. – Roanoke Civil War Round Table. Speaking on Jeb Stuart’s Ride Around McClellan: Skill, Luck or Incompetence? Details TBA. Sunday, May 26, 2013 – Staunton, Va. – Confederate Memorial Day ceremony, 2:30 pm, at Thornrose Cemetery. Sponsored by Jeb Stuart Chapter #156, United Daughters of the Confederacy. Friday, October 4, 2013 – Winchester Va – 1-4 pm at N-SSA meet at Fort Shenandoah signing books at Old Court House CW Museum booth. Friday, October 11, 2013 – Winchester Va – McCormick CW Institute Fall battlefield tour dinner. Tuesday, November 12, 2013 – Winchester, Va. – presentation on Jeb Stuart’s Great Chickahominy Cavalry Raid for Turner Ashby Camp, SCV at 7 pm. Saturday & Sunday, November 16-17, 2013 – Richmond, Va. – Capitol of the Confederacy Civil War Show. Visit the Angle Valley Press table. Held at Richmond Int. Raceway, 600 E. Laburnum Ave. Saturday 9- 5 & Sunday 9-3. For info see link above. Saturday, December 14, 2013 – Richmond, Va. – Christmas Banquet speaker for Jeb Stuart Camp 1343, SCV. At Grapevine Restaurant 11055 Three Chopt Road. Dinner at 6 pm and presentation at 7 pm. 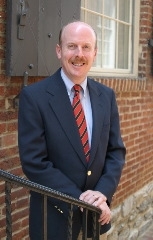 Tuesday, April 10, 2012 – Winchester, Va. – Winchester Host Lions Club luncheon. Lee-Jackson Motel banquet room. Millwood Ave., Winchester 22601. 12 noon. Wednesday, September 19, 2012 – Lexington, Va. – Rockbridge Civil War Round Table at Engineers Hall on VMI campus. Evening time TBA. Saturday, October 6, 2012 – Gettysburg, Pa. – Jeb Stuart Camp SCV Annual Banquet, Dobbin House, Steinwehr Ave., 6:30 pm. Saturday, May 28, 2011 – Charlottesville, Va. – Memorial speaker at Confederate Cemetery at UVa for Alabemarle Chapter 154, UDC. Details TBA. Saturday, October 1, 2011 – Lexington, Va. – Washington & Lee University Bookstore for homecoming weekend. 11:30 a.m. – 1:30 p.m.
Saturday & Sunday, November 19-20, 2011 – Richmond, Va. – 31st Annual Capital of the Confederacy Civil War Show. Richmond Raceway Complex at 600 E. Laburnum Ave. Come visit the Angle Valley Press table!